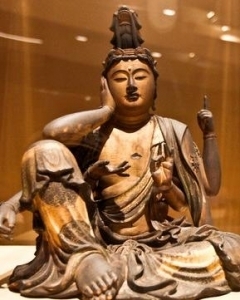 The altogether too brief Kamakura period showcased art that juxtaposed fascinating Buddhist divinities alongside of modern notions of artistic realism. Asia Society recently featured an exhibition that covered this time period in Japanese history, and it featured many different representations of Buddhist divinities in vibrant styles. An approximately 22-inch tall head of a guardian with a terrifying expression was carved in Japan from cypress wood sometime around the 13th century. His intense appearance and presence as well as the smooth carvings in his knit up brow and gaping mouth offer visionary realism. Rather than depict the kind of thing that people from earlier Japanese periods might have been expecting, this piece offers shocking realism juxtaposed with something supernatural. Daiitoku Myoo was the wisdom king of the theology of the period; photo credit the New York Times. Buddhist philosophers generally identify four different guardian kings that defend temples as well as the original Buddha. They scare away those who are not yet ready for enlightenment. Artists during the Kamakura period of 1185-1333 were concerned with a perceived threat of a Mongolian invasion. Japanese forces had to repel Mongolian troops in 1274 and once again in 1281. Warlords also fought various domestic wars. Those military conflicts are the same that caused several prominent temples to fall, and precious works of art were lost in the process. This might help to explain the sudden interest in carving these guardian kings that defend temples from danger. The shocking realism in such supernatural appearances must surely have made vagabonds think twice before attacking a temple. Nyoirin Kannon in the Kamakura period; photo credit the New York Times. Daiitoku Myoo is the king associated with inspiring power, and is perhaps most famous for having six faces. He rides a small water buffalo, and shows an unusual appearance of gleeful fury while holding a sword, trident and noose. 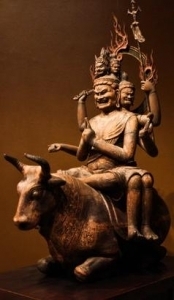 The sculpture of this particular royal divinity from the Kamakura era that was on display at Asia Society certainly looked fierce to say the very least, but it should be noted that these kings are not wrathful masters to those who treat temples properly. These preoccupations in the time period were because artists were forced to watch their precious sculptures destroyed. Those who were good stewards of the temples were rewarded for their piety according to these same philosophies. Today, of course, we are doubly rewarded as many of these guardian kings and other images of divine royalty are powerful symbols that those who appreciate fine art can continue to enjoy many centuries after they stood protecting those temples so stalwartly.